2019/02/01: Version 10.2.0 has been released. SPECTRA is an application software to calculate optical properties of synchrotron radiation (SR) emitted from bending magnets, wigglers (conventional and elliptical) and undulators (conventional, helical, elliptical and figure-8). Calculations of radiation from an arbitrary magnetic field distribution are also available. 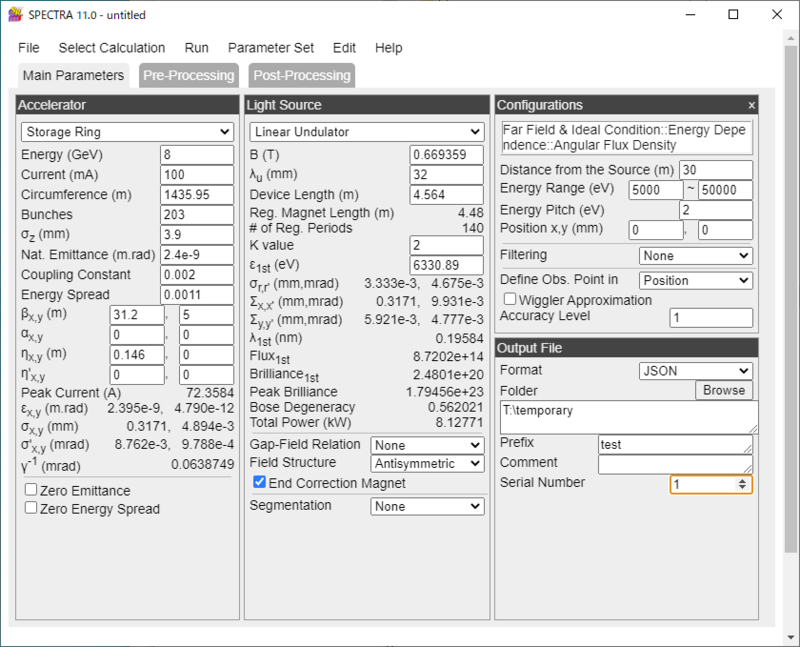 Parameters on the electron beam and the source can be edited completely on graphical user interfaces (GUIs) and it is possible to show the calculation result graphically. The energy spectrum and radiation power after transmitting various filters and convolution of detector's resolution are also available. Because of the security enhancement made in this OS, many (freely-available) applications downloaded from anywhere out of the App Store may fail, which is known as an "App Translocation" problem. To avoid this and run SPECTRA correctly, the users should once move the executable file ("spectra" application file in the SPECTRA directory, or more correctly "spectra.app" directory) to somewhere out of the SPECTRA directory, then return it to the original location. This "incantation" will fix the problem. If the users are presenting or publishing their results obtained with using SPECTRA, they are kindly requested to cite the related reference(s). The graphical part of SPECTRA is written in the C++ language with wxWidgets GUI tool kit and OpenGL graphic library. Thanks to portability of these libraries, SPECTRA will run on most available operating systems such as Microsoft Windows, Mac OS X, Linux, and most unix-like operating systems. In version 10.0, rigorous estimation of brilliance based on the Wigner function method has become available, which is in contrast to the traditional method based on the Gaussian approximation. Although the brilliance estimation by the Gaussian approximation is still available for compatibility with the older versions, it is referred to as GA.Brilliance (Gaussian-Approximated) and is distinguished from the rigorous estimation. SPECTRA is equipped with a full graphical user interface to help the user to input and edit parameters necessary for SR calculation, and to visualize the results of calculation. Examples of the preprocessors are shown below.